With scorching riffs and remarkable stage presence, Zakk Wylde has earned his reputation as heavy metal's premier lead guitarist. From Ozzy Osbourne, Pride and Glory, and now Black Label Society, Zakk has always used EMG active pickups. The Zakk Wylde model features the EMG-85 and EMG-81, as used on his signature bull's-eye Les Paul guitar. Installation is literally a snap—it's solderless, just use the included Quck-connect cables. Although the EMG-85 pickup has more measurable output than the 81, its frequency response and string interface are different. The 85 uses two Alnico magnet-loaded coils with a wide aperture to maintain a beefy low end and a fatter top end. Because of a more natural tone, it works great as a rhythm and blues pickup because it has loads of output but isn't muddy. It's a perfect choice as a rhythm pickup in combination with an 81 in the bridge. The midrange has great definition and doesn't get foggy or muddy in the rhythm position. The EMG-85 works best if you like the natural distortion that comes from overdriving the front end of your amp. Under any condition, the humbucker responds accurately to your technique. 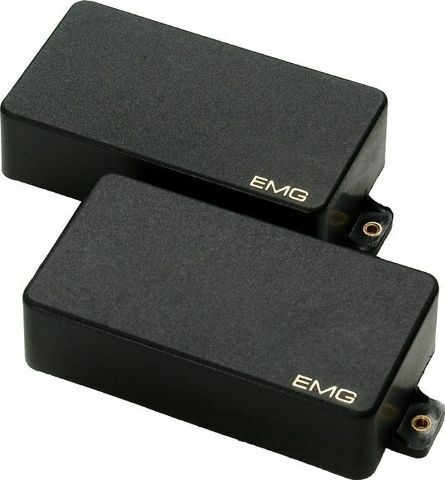 The EMG-81 pickup is a high-output pickup designed especially for the lead guitarist. The 81 is at its best for high volume overdrive and amps with a master volume. Whether you're playing power rock 'n' roll, or overdriving your amp, there's a razor sharp attack, and incredible sustain for brilliant soloing. If you're looking for exceptional qualities in a rock pickup, the EMG-81 is the one. Distortion during lead passages is consistent, sustain is long and the breakup fades smoothly. The ceramic magnet in combination with wide aperture steel poles lend a quick attack but the tone stays nice and fat at the same time. Perfect if you're the only guitarist in the band, and need to switch from rhythm to lead and still keep the band moving. Another great thing about the EMG-81 humbucker is it's quiet. If you're playing at really high gain the last thing you need is noise.